This was released in either 1962 or 1963 on Cameo Records. Phil is not credited on the album, and until the release of David Cohen’s book, it was not widely known that such a record existed. Even then, although it was known that he had made such a record, it was not known what the title of the record was. David Cohen was finally able to identify that this was indeed Phil’s first commercial record. "I don't believe you. Liar!" nothing significant that I had overlooked. Ok, we all know what pride cometh before now don't we? of information that he had gotten from Phil. his first record was "All The News" or the New  Folks album on Vanguard. pass-the-hat clubs of the Village." Elektra, All the News That's Fit to Sing, in April 1964.
album, utilizing his considerable connections in the music business. labeled the mystery at the end of the discography in my book . in turn for possible clues. possibles. A quick text search for 'camp' turned up a hit. 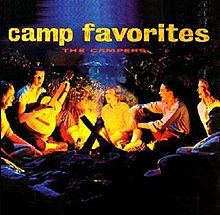 Campers -- Camp Favorites (Cameo C-1047) 1963.
libraries) located a copy, at the Bowling Green University. a call to Happy proved that this was not the case. bail cuz all my sins are taken away"). effects rarely produced or heard on any recording." doubt if many copies were pressed, let alone sold." Cameo in the 1960's and changed the name to Abkco (Allen B. Klein Co.). All songs credited as "Traditional", Wyncote Music ASCAP.